Andre Reis, D.D.S., M.S., Ph.D., joined the University of Florida College of Dentistry as a clinical associate professor in the Department of Restorative Dental Sciences Division of Operative Dentistry on October 15, 2018. Reis will primarily focus on providing didactic, preclinical and clinical teaching to predoctoral students and residents in the operative master’s program. He is also providing patient care in the UF Health Faculty Dental Practice. 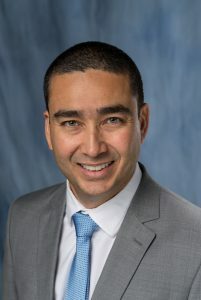 Reis moved to Gainesville, Florida, from Sao Paulo, Brazil, where he had worked in private practice since 2005 and also served as an associate professor in operative dentistry at Guarulhos University, or GU, since 2006. Born in Rio de Janeiro, Brazil, Reis attended the Piracicaba School of Dentistry at the University of Campinas, or UC, in Brazil where he earned his dental degree in 1999 and his master’s in operative dentistry in 2002. He began his doctorate studies there as well but finished at the University of North Carolina at Chapel Hill, or UNC, in 2005. Reis has a great deal of academic experience. In addition to his time on faculty at GU, he served as a teaching assistant and a visiting scholar at UNC in 2004; and an instructor at UC from 2000 to 2003, and in 2005. His research interests include resin-tooth adhesion, resin-based composites, clinical trials, dental biomaterials, electron microscopy, and ceramics. He is a member of the International Association for Dental Research, the Academy of Dental Materials and the Brazilian Society for Dental Research.